Our intention is to create a systemic intervention that helps reorient the way that organizations consider their business performance—relative to the desired future state of sustainability, rather than relative to past “unsustainable” performance. The long-term benefit of doing so is to help create clarity in the marketplace to differentiate between businesses that meet rigorous social, environmental, accountability, and transparency standards and those that do not. Would We Know a Sustainable Business If We Saw One? There are many rating, ranking, and certifying organizations (e.g., the Global Initiative for Sustainability Ratings has identified 108 organizations directly or indirectly involved in such efforts), and it is difficult to tell the good ones from the bad. This undermines trust and confuses decision-making. Rankings are commonly based on past performance or the relative performance of peers rather than what is necessary to achieve full sustainability. This further undermines trust about whether the ranking has any real meaning. Sustainability ratings generally do not provide useful information for investors and are therefore of limited utility for investment decisions. What distinguishes some of the true leaders in the sustainable business movement, though, is their ability to drive innovation by articulating a sustainable vision for their business and monitoring performance relative to that vision—i.e., “how much closer to sustainability are we getting through our innovations and performance improvements?” The Natural Step has long believed that rating and ranking efforts could accelerate the sustainable business movement if they could only find a way to orient their rankings similarly. Revisions of the B Impact Assessment (the rating system for B Corps), reflective of the science-based principles of the Framework for Strategic Sustainable Development based on recommendations generated in a pilot project with B Lab. An increased number of business leaders and other stakeholders voicing support for the need for a Gold-standard Benchmark for Sustainable Business. Multiple rounds of consultation with business, rating and ranking entities, non-profits and others have garnered enthusiastic feedback regarding the need for such a benchmark, the quality of work done to date, and the collaborative approach being employed. The emergence of new collaborative initiatives to advance the project. A series of priority collaborative initiatives to take the project to the next level were identified through a series of consultations that involved a range of organizations including among others SustainAbility, Sustainalytics, B Lab, the UN Global Compact, CBSR, GlobeScan, KPMG, Stratos, and Comparison International. These suggestions were incorporated into the plan for Phase II of the project. 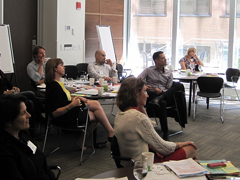 Building on the momentum generated in Phase I, The Natural Step Canada and its partners are taking the project to the next level by engaging with experts and strategic audiences. In particular, in Phase II the project seeks to pilot the emerging approach with new partners and to engage investors who are looking for credible and transparent ways to evaluate sustainability performance as a strong indicator of the future fitness of businesses in which they seek to invest capital. In Phase II, we aim to achieve the following outcomes. The project is also supported by developmental evaluation expert, Mark Cabaj, president of Here to There Consulting. Chad Park and Bob Willard will be sharing the learnings from this project in their capacity as Expert Advisors for the Global Initiative for Sustainability Ratings and other related initiatives.